This is a guest blog post from Jane Finette, Executive Program Manager, who works closely with me in Office of the Chair. In a recent blog post Mitchell described why she has been eager to see the hiring process at Mozilla have a larger focus on cross-functional participation, particularly for senior leaders whom we expect to represent a broad swath of Mozilla. Enabling wider participation in how we hire for leadership has been our starting point. She notes we began organizing panel discussions for a broader set of people to talk to the candidate some time ago. The need to hire for a new senior role, Vice President of Marketing Communications, presented an opportunity to further explore this new type of approach. Jascha Kaykas-Wolff, our CMO and the hiring manager for this role, and I sat down to plan and document some further experiments with the hiring process for this role. Our goal from the start was to explore two outcomes: an increased participation within the organization and the simultaneous creation of a meaningful process for candidates to evaluate us. Enabling participation in the hiring process for the VP of MarComm position was particularly crucial because this person has a role that represents and communicates publicly about a broad swath of Mozilla. The VP of MarComms oversees the global communications, social media, user support and content marketing teams and works across the organization to develop impactful outbound communications for Mozilla and Firefox products. Jascha and I designed the interview process right at the start with participation as one of the key objectives. Together we identified interviewers as peers, direct reports, expertise leaders and others who were not from the group where the candidate would work; in this case Marketing. We identified cross functional areas the hire would interact with on a regular and a geographic basis, these were people who might not otherwise have been part of the interview process. 1st round: Peers (no direct reports). Purpose: Interviewing for values match, strong competency in area of expertise. 2nd round: Directs report + leaders in area of expertise, including cross-functional areas. Purpose: Interviewing for leadership attributes, values match, competency in area of expertise. 3rd round: Panel – including moderator and panel members who were not part of the group where the candidate would work. Panel was a maximum of 7 people. Purpose: Validate values match. Give insights into broader organizational dynamics. 4th round: Case study including peers + directs reports and a small selection of members of the panel. Maximum of 12 people. Purpose: Place for the person to demonstrate their expertise and shine, and experience a typical environment. Purpose: Validate values match, leadership and skills where appropriate. We conducted well over 50 screenings and entered 8 very well qualified candidates into our process. The process took approximately four months to complete, approximately the same amount of time required for an executive level hire. The hiring process for the VP of MarComm is now complete. Alex Salkever, joined Mozilla as our Vice President of Marketing Communications on May 18, 2016. We have a hypothesis that increasing the level of diversity and participation will lead to stronger hires at Mozilla. We are continuing the pilot to explore this further. By increasing the level of diverse participation, we have been able to get more input from across the organization, finding blind-spots and bias. In our pilot case, the role was intended to be hired outside of the US due to the global nature of the position. The hiring manager explained he was heavily influenced by his peers in the organization regarding the location of this hire, which could have led to a suboptimal situation if he had pushed with his original preference. 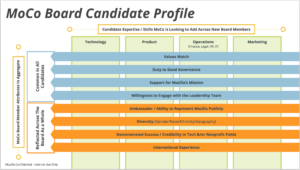 Additionally, we chose a candidate who has strong technical chops for a Marcom lead and yet, the recommendation was shaped heavily by the feedback provided from the non-marketing/policy participants. We are exploring turning this into a repeatable interview process. We have created an environment where candidates can also evaluate us from multiple perspectives. (i) By adding differing perspectives to our current hiring process, we are exposing a new hire to our unique culture and operating principles right from the start. (ii) The new hire already knows and has the potential to have credibility with a significant number of people at Mozilla from the first day. The process is essentially a way of reputation building on a distributed basis. Our starting point for a more participatory hiring process is our senior roles. As Mitchell noted, “the more senior the role, the broader a part of Mozilla we expect someone to be able to lead, and the broader a sense of representing the entire organization we expect that person to have.” These roles require an ability to interact, motivate and work across teams, they also have the high potential to affect culture. A key practice to apply in all hiring processes: define (i) what success for the role will be and (ii) all the stakeholders in the organization whom can support success, this creates the pool of participants. In this case, we worked with both the hiring manager and the recruiter at the start of the process to design and determine the process. A previous learning indicated a broader group of diverse interviewees should be in the 3rd stage of the interview, not the last stage as their feedback proved to be critical in the decision process. This was upheld in this example. In order to invite a broad group to meet with a candidate, this could take the form of a panel to create an effective use of time. We note that time taken by increasing participation in hiring could inhibit the process. In subsequent examples we intend to create and test a lightweight version of the process. When involving more people in the process, we must be careful to collect candidate feedback individually, as in larger group settings ‘group think’ can happen. Often a standard type of interview process is designed for the company, rather than the individual being interviewed. The standard process is intended to maximize assessment in a core area of expertise, whereby candidates are evaluated by their manager, peers and direct reports in their domain only. This creates an unhealthy power balance and exposes a set of addressable biases in the process such as ones based on cultural fit, and skills gap perspectives from other areas of the company. We will continue to explore, record results and share further findings. We have now begun another participatory hiring experiment at the ‘director’ level role. It’s an interesting question what piece of evidence would conclusively prove cross-functional and cross-level participation in hiring leadership brings benefits to an organization. We’ll continue to experiment. Last fall I came across a hiring practice that surprised me. We were hiring for a pretty senior position. When I looked into the interview schedule I realized that we didn’t have a clear process for the candidate to meet a broad cross-section of Mozillians. We had a good clear process for the candidate to meet peers and people in the candidate’s organization. But we didn’t have a mechanism to go broader. This seemed inadequate to me, for two reasons. First, the more senior the role, the broader a part of Mozilla we expect someone to be able to lead, and the broader a sense of representing the entire organization we expect that person to have. Our hiring process should reflect this by giving the candidate and a broader section of people to interact. Give candidates a chance to demonstrate their competence to the same set of people who hope they can lead. The more senior the role, the broader a part of Mozilla we expect someone to be able to lead. Expand the number of people who have a chance to make at least a preliminary assessment of a candidate’s readiness for a role. This isn’t the same as the open source ideal of working with someone for a while. But it is a big difference from never knowing or seeing or being consulted about a candidate. We want to increase the number of people who are engaged in the selection and then helping the newly hired person succeed. We made a few changes right away, and we’re testing out how broadly these changes might be effective. Our immediate fix was to organize a broader set of people to talk to the candidate through a panel discussion. We aimed for a diverse group, from role to gender to geography. We don’t yet have a formalized way to do this, and so we can’t yet guarantee that we’re getting a representational group or that other potential criteria are met. However, another open source axiom is that “the perfect is the enemy of the good.” And so we started this with the goal of continual improvement. We’ve used the panel for a number of interviews since then. We looked at this in more detail during the next senior leadership hire. Jascha Kaykas-Wolff, our Chief Marketing Officer, jumped on board, suggesting we try this out with the Vice President of Marketing Communications role he had open. Over the next few months Jane Finette (executive program manager, Office of the Chair) worked closely with Jascha to design and pilot a program of extending participation in the selection of our next VP of MarComm. Jane will describe that work in the next post. Here, I’ll simply note that the process was well received. Jane is now working on a similar process for the Director level. I’ve decided to dedicate time to this and look at ways to make sure our goals of building open practices into Mozilla are updated and more fully developed. This is one of the areas of focus I mentioned in an earlier post describing where I spend my time and energy. Fostering meaningful conversations and exchange of knowledge across the organization, with a particular focus on bettering communications between Mozillians and leadership. Follow-up posts will have more info about each of these projects. In general the goal of these experiments is to identify working models that can be adapted by others across Mozilla. And beyond that, to assist other Mozillians figure out new ways to “practice open” at Mozilla. It is critical to ensure that women are active participants in digital life. Without this we won’t reach full economic empowerment. 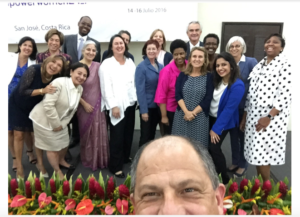 This is the perspective and focus I bring to the UN High Level Panel for Women’s Economic Empowerment (HLP), which met last week in Costa Rica, hosted by President Luis Guillermo Solis. In the meeting we learned about actions the Panel members have initiated, and provided feedback and guidelines on the first draft of the HLP report. The goal for the report is to be as concrete as possible in describing actions in women’s economic empowerment which have shown positive results so that interested parties could adopt these successful practices. An initial version of the report will be released in September, with the final report in 2017. In the meantime, Panel members are also initiating, piloting and sometimes scaling activities that improve women’s economic empowerment. As Phumzile Mlambo-Ngcuka, the Executive Director of UN Women often says, the best report will be one that points to projects that are known to work. One such example is a set of new initiatives, interventions and commitments to be undertaken in the Punjab, announced by the Panel Member and Deputy from Pakistan, Fiza Farhan and Mahwish Javaid. Mozilla is also involved in the theme of digital inclusion as a cross-cutting, overarching theme of the HLP report. This is where Anar Simpson, my official Deputy for the Panel, focuses her work. We are liaising with companies in Silicon Valley who are working in the fields of connectivity and distribution of access to explore if, when and and how their projects can empower women economically. We’re looking to gather everything they have learned about what has been effective. In addition to this information/content gathering task, Mozilla is working with the Panel on the advocacy and publicity efforts of the report. This post was originally published on the Mozilla Blog. I’ve written a few posts about the role of the Board of Directors at Mozilla. At Mozilla, we invite our Board members to be more involved with management, employees and volunteers than is generally the case. It’s not that common for Board members to have unstructured contacts with individuals or even sometimes the management team. The conventional thinking is that these types of relationships make it hard for the CEO to do his or her job. We feel differently. We have open flows of information in multiple channels. Part of building the world we want is to have built transparency and shared understandings. We also prefer a reasonably extended “get to know each other” period for our Board members. Sometimes I hear people speak poorly of extended process, but I feel it’s very important for Mozilla. Mozilla is an unusual organization. We’re a technology powerhouse with a broad Internet openness and empowerment mission at its core. We feel like a product organization to those from the nonprofit world; we feel like a non-profit organization to those from the Internet industry. It’s important that our Board members understand the full breadth of Mozilla’s mission. It’s important that Mozilla Foundation Board members understand why we build consumer products, why it happens in the subsidiary and why they cannot micro-manage this work. It is equally important that Mozilla Corporation Board members understand why we engage in the open Internet activities of the Mozilla Foundation and why we seek to develop complementary programs and shared goals. I want all our Board members to understand that “empowering people” encompasses “user communities” but is much broader for Mozilla. Mozilla should be a resource for the set of people who care about the open Internet. We want people to look to Mozilla because we are such an excellent resource for openness online, not because we hope to “leverage our community” to do something that benefits us. These sort of distinctions can be rather abstract in practice. So knowing someone well enough to be comfortable about these takes a while. We have a couple of ways of doing this. First, we have extensive discussions with a wide range of people. Board candidates will meet the existing Board members, members of the management team, individual contributors and volunteers. We’ve been piloting ways to work with potential Board candidates in some way. We’ve done that with Cathy Davidson, Ronaldo Lemos, Katharina Borchert and Karim Lakhani. We’re not sure we’ll be able to do it with everyone, and we don’t see it as a requirement. We do see this as a good way to get to know how someone thinks and works within the framework of the Mozilla mission. It helps us feel comfortable including someone at this senior level of stewardship. Job descriptions often get long and wordy. 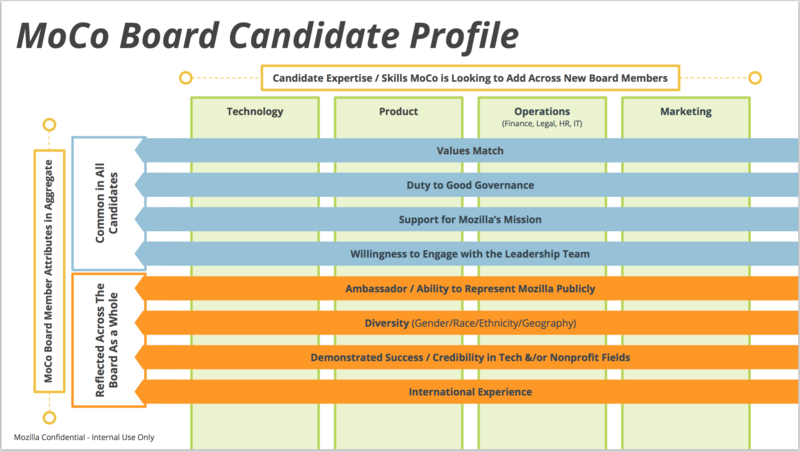 We have those too but, for the search of new Board members, we’ve tried something else this time: a visual role description. The horizontal lines speaks to things that every Board member should have. For instance, to be a Board member, you have to care about the mission and you have to have some cultural sense of Mozilla, etc. They are a set of things that are important for each and every candidate. In addition, there is a set of things that are important for the Board as a whole. For instance, we could put international experience in there or whether the candidate is a public spokesperson. We want some of that but it is not necessary that every Board member has that. In the vertical green columns, we have the particular skills and expertise that we are looking for at this point. 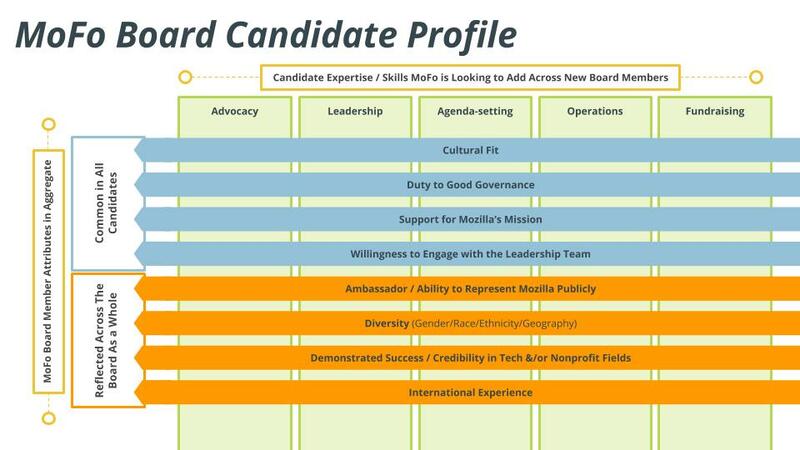 We would expect the horizontal lines not to change too much over time and the vertical lines to change depending on who joins the Board and who leaves. I invite you to look at these documents and provide input on them. 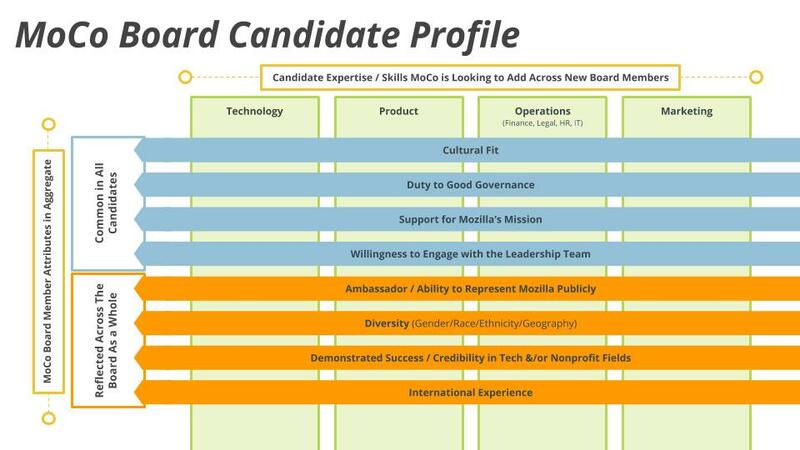 If you have candidates that you believe would be good Board members, send them to the boarddevelopment@mozilla.com mailing list. We will use real discretion with the names you send us. We’ll also be designing a process for how to broaden participation in the process beyond other Board members. We want to take advantage of the awareness and the cluefulness of the organization. That will be part of a future update. Both the Mozilla Foundation and Mozilla Corporation Board Candidate Profiles have been updated. Cultural Fit has been updated to ‘Values Match’. Since the Mozilla Foundation was founded in 2003, we’ve grown remarkably – from impact to the size of our staff and global community. We’re indebted to the people whose passion and creativity made this possible, people like Joi Ito. Joi is a long-time friend of Mozilla. He’s a technologist, a thinker, an activist and an entrepreneur. He’s been a Mozilla Foundation board member for many years. He’s also Director of the MIT Media Lab and was very recently appointed Professor of the Practice by MIT. As Joi has become more deeply involved with the Media Lab over the past few years, we’ve come to understand that his most important future contributions are, rather than as a Board member, to spur innovative activities that advance the goals of both the Mozilla Foundation and the Media Lab. The first such project and collaboration between Mozilla and the Media Lab, is an “Open Leadership Camp” for senior executives in the nonprofit and public sectors. The seeds of this idea have been germinating for a while. Joi and I have had an ongoing discussion about how people build open, participatory, web-like organizations for a year or so now. The NetGain consortium led by Ford, Mozilla and a number of foundations, has shown the pressing need for deeper Internet knowledge in the nonprofit and public sectors. Also, Mozilla’s nascent Leadership Network has been working on how to provide innovative ways for leaders in the more publicly-minded tech space to learn new skills. All these things felt like the perfect storm for a collaborative project on open leadership and to work with other groups already active in this area. Bring together a set of experienced leaders from ‘open organizations’ and major non-profit and public sector organizations. Get them working on practical projects that involve weaving open techniques into their organizations. Document and share the learning as we go. Topics we’ll cover include everything from design thinking (think: sticky notes) to working in the open (think: github) to the future of open technologies (think: blockchain). The initial camp will run at MIT in early 2017, with Joi and myself as the hosts. Our hope is that a curriculum and method can grow from there to seed similar camps within public-interest leadership programs in many other places. I’m intensely grateful for Joi’s impact. We’ve been lucky to have him involved with Mozilla and the open Internet. We’re lucky to have him at the Media Lab and I’m looking forward to our upcoming work together. In a previous post, I gave an overview of the five general areas I focus on in my role as Founder and Executive Chair of Mozilla. The first of the five areas is the traditional “Chair of the Board” role. Here I’ll give a bit of detail about one initiative I’m currently working on in this area. Mozilla is an unusual organization and it takes a while to understand us. We intend to increase diversity across a number of axis, from gender to geography. A conscious effort to expand the set of people who interact with and from whom Board level candidates might come is critical. So while we are looking to expand each of the Mozilla Foundation and Mozilla Corporation Boards in 2016, the goal here is much longer-term and broader. This work is also part of the development of the Mozilla Leadership Network (MLN), a new initiative being developed by the Mozilla Foundation team. The idea underpinning the Mozilla Leadership Network is that Mozilla is most effective when many people feel connected to us and feel Mozilla gives extra impact to their actions on behalf of an open Internet. The MLN seeks to provide these connection points. We hope the MLN will include a wide range of people, from students figuring out their path in life to accomplished professionals and recognized thought leaders. Both Mozilla and I have a long history of connecting with individual contributors and with local and regional communities. This year I’ve added this additional focus on senior advisors and potential Board level contributors. This is an ongoing process. So far I’ve had three or four brainstorming sessions focused on expanding the network of people we might want to get to know. From this point, we do some information gathering to get to know more about people we now have pointers to. Then we start to get to know people, to see (a) who has a good feel for the open Internet, Mozilla, or the kinds of initiatives we’re focused on; and (b) who has both interest and time to engage with Mozilla more. I’ve had detailed conversations with nine of the people we’ve identified, sometimes multiple times and hours. Of these, approximately 75% are women and two third are located outside the US, representing our interest in increasing our diversity along multiple axis. These conversations are not about “do you want to be a board member?”. They are pretty detailed explorations of a person’s sense of the Open Internet, Mozilla’s role, our initiatives, challenges and opportunities. The conversations are invitations to engage with Mozilla at any level and explorations of how appealing our current initiatives might be. In the next week or so I’ll do a follow up post about the Board search in particular. The Mozilla communities are part of what I love most about Mozilla. I remain deeply involved with our current communities through the work of the Participation team. This new focus broadens the possibilities. The number of people who look to Mozilla to help build an Internet that is open and accessible is both motivating and inspiring. What is the Role of Mozilla’s Executive Chair? What does the Executive Chair do at Mozilla? This question comes up frequently in conversations with people inside and outside of Mozilla. I want to answer that question and clearly define my role at Mozilla. The role of Executive Chair is unique and entails many different responsibilities. 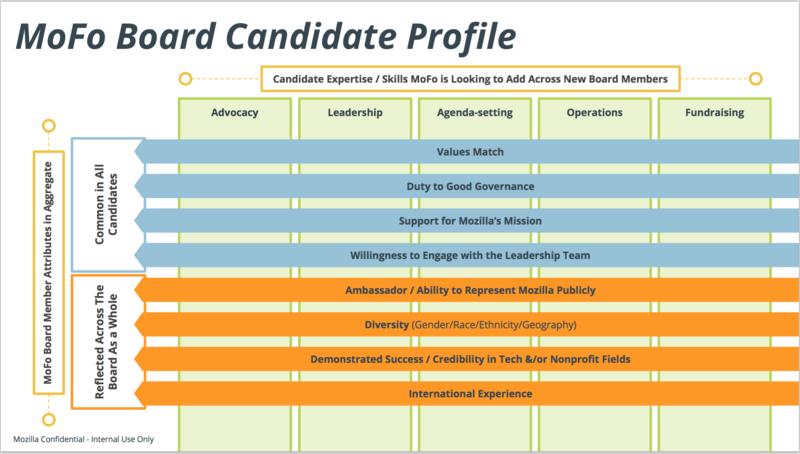 In particular at Mozilla, the Executive Chair is something more than the well understood role of “Chairman of the Board.” Because Mozilla is a very different sort of organization, the role of Executive Chair can be highly customized and personal. It is not generally an operational role although I may initiate and oversee some programs and initiatives. In this post I’ll outline the major areas I’m focused on. In subsequent posts I’ll go into more detail. This portion of my role is similar to the more traditional Chair role. 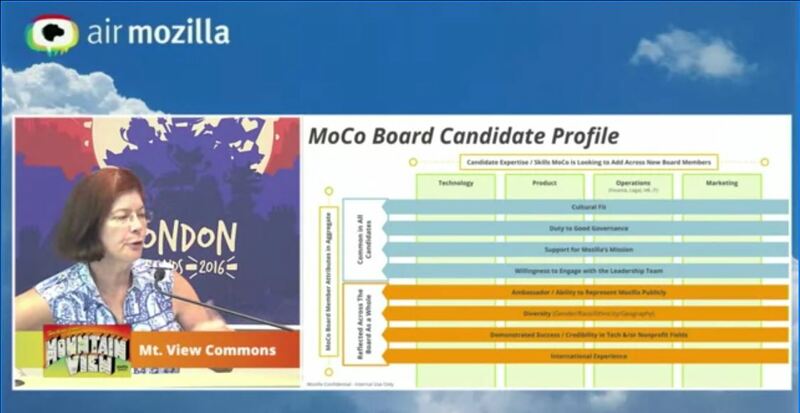 At Mozilla in this capacity I work on mission focus, governance, development and operation of the Board and the selection, support and evaluation of the most senior executives. In our case these are Mark Surman, Executive Director of Mozilla Foundation and Chris Beard, CEO of Mozilla Corporation. Less traditionally, this portion of my role includes an ongoing activity I call “weaving all aspects of Mozilla into a whole.” Mozilla is an organizationally complex mixture of communities, legal entities and programs. Unifying this into “one Mozilla” is important. This is our version of the general “public spokesperson” role. In this part of my role, I speak at conferences, events and to the media to communicate Mozilla’s message. The goal of this portion of my role is to grow our influence and educate the world on issues that are important to us. This role is particularly important as we transform the company and the products we create, and as we refocus on entirely new challenges to the Open Web, interoperability, privacy and security. This is the core of the work that is intensely customized for Mozilla. It is an area where Mozilla looks to me for leadership, and for which I have a unique vision. Mozilla’s core DNA is a mix of the open source/free software movement and the open architecture of the Internet. We were born as a radically open, radically participatory organization, unbound to traditional corporate structure. We played a role in bringing the “open” movement into mainstream consciousness. How does and how can this DNA manifest itself today? How do we better integrate this DNA into our current size? Needless to say I work hand-in-hand with Chris Beard and Mark Surman in these areas. I’ve played this role for just over 20 years now, working closely with Mozilla’s technologists, individual contributors and leadership. I help us take new directions that might be difficult to chart. And in this role I can take risks that may make us uncomfortable in the shorter term but yield us great value over the longer term. By helping to point us towards the cutting edge of our technology, I reinforce the importance of change and adaptation in how we express our values. I’ve been working with Mark Surman on this topic since he joined us. We’ve expanded our mission and programs into digital literacy and education, journalism, science, women and technology and now the Mozilla Leadership Network. I have also championed Mozilla’s expanded efforts in public policy. I continue to look at how we can do more (and am always open to suggestions). So these are the different parts of my role. Hopefully it provides you with a framework for understanding what I do and how I see myself interacting with Mozilla. I’m planning to write a series of posts describing the work underway in these areas. Please send comments or feedback or questions to “office of the chair mailing list.” And thanks for your interest in Mozilla.